strict warning: Non-static method view::load() should not be called statically in /home/sites/ledbillboards.co.uk/public_html/sites/all/modules/views/views.module on line 1079.
strict warning: Declaration of i18nviews_plugin_localization_i18nstrings::translate_string() should be compatible with views_plugin_localization::translate_string($string, $keys = Array, $format = '') in /home/sites/ledbillboards.co.uk/public_html/sites/all/modules/i18nviews/includes/i18nviews_plugin_localization_i18nstrings.inc on line 60.
strict warning: Declaration of views_handler_field::query() should be compatible with views_handler::query($group_by = false) in /home/sites/ledbillboards.co.uk/public_html/sites/all/modules/views/handlers/views_handler_field.inc on line 1113.
strict warning: Declaration of views_handler_field_markup::element_type() should be compatible with views_handler_field::element_type($none_supported = false, $default_empty = false, $inline = false) in /home/sites/ledbillboards.co.uk/public_html/sites/all/modules/views/handlers/views_handler_field_markup.inc on line 49.
strict warning: Declaration of views_handler_sort::options_validate() should be compatible with views_handler::options_validate($form, &$form_state) in /home/sites/ledbillboards.co.uk/public_html/sites/all/modules/views/handlers/views_handler_sort.inc on line 165.
strict warning: Declaration of views_handler_sort::options_submit() should be compatible with views_handler::options_submit($form, &$form_state) in /home/sites/ledbillboards.co.uk/public_html/sites/all/modules/views/handlers/views_handler_sort.inc on line 165.
strict warning: Declaration of views_handler_sort::query() should be compatible with views_handler::query($group_by = false) in /home/sites/ledbillboards.co.uk/public_html/sites/all/modules/views/handlers/views_handler_sort.inc on line 165.
strict warning: Declaration of views_handler_filter::options_validate() should be compatible with views_handler::options_validate($form, &$form_state) in /home/sites/ledbillboards.co.uk/public_html/sites/all/modules/views/handlers/views_handler_filter.inc on line 576.
strict warning: Declaration of views_handler_filter::query() should be compatible with views_handler::query($group_by = false) in /home/sites/ledbillboards.co.uk/public_html/sites/all/modules/views/handlers/views_handler_filter.inc on line 576.
strict warning: Declaration of views_handler_filter_search::exposed_validate() should be compatible with views_handler::exposed_validate(&$form, &$form_state) in /home/sites/ledbillboards.co.uk/public_html/sites/all/modules/views/modules/search/views_handler_filter_search.inc on line 112.
strict warning: Declaration of views_handler_area::query() should be compatible with views_handler::query($group_by = false) in /home/sites/ledbillboards.co.uk/public_html/sites/all/modules/views/handlers/views_handler_area.inc on line 75.
strict warning: Declaration of views_handler_area_text::options_submit() should be compatible with views_handler::options_submit($form, &$form_state) in /home/sites/ledbillboards.co.uk/public_html/sites/all/modules/views/handlers/views_handler_area_text.inc on line 119.
strict warning: Declaration of views_plugin_query::options_submit() should be compatible with views_plugin::options_submit($form, &$form_state) in /home/sites/ledbillboards.co.uk/public_html/sites/all/modules/views/plugins/views_plugin_query.inc on line 169.
strict warning: Declaration of views_plugin_style_default::options() should be compatible with views_object::options() in /home/sites/ledbillboards.co.uk/public_html/sites/all/modules/views/plugins/views_plugin_style_default.inc on line 24.
strict warning: Declaration of views_plugin_row::options_validate() should be compatible with views_plugin::options_validate(&$form, &$form_state) in /home/sites/ledbillboards.co.uk/public_html/sites/all/modules/views/plugins/views_plugin_row.inc on line 136.
strict warning: Declaration of content_handler_field::element_type() should be compatible with views_handler_field::element_type($none_supported = false, $default_empty = false, $inline = false) in /home/sites/ledbillboards.co.uk/public_html/sites/all/modules/cck/includes/views/handlers/content_handler_field.inc on line 228.
strict warning: Declaration of views_handler_argument::options_validate() should be compatible with views_handler::options_validate($form, &$form_state) in /home/sites/ledbillboards.co.uk/public_html/sites/all/modules/views/handlers/views_handler_argument.inc on line 917.
strict warning: Declaration of views_handler_argument::query() should be compatible with views_handler::query($group_by = false) in /home/sites/ledbillboards.co.uk/public_html/sites/all/modules/views/handlers/views_handler_argument.inc on line 917. The latest technology design & the highest quality elements used make our unique LED billboard the ultimate in reliability. IN ONE COMPLETED ADVERTISING SYSTEM. We are based on a high European quality products. Most of components for use in the LED billboard manufacturing come from Poland. All these components are carefully selected, for example: LEDs are designed to build new technology traffic lights - very bright, reliable and last longer (they must be safety for traffic), modern power supply adaptors, quality internal and external components, which resistant to weather and environmental conditions. Smart design: easy to install / erect / hang, extendable, low maintenance, panel matrix (easy and fast to diagnostic). To build any led sign are used expensive, but very bright (triple ultra bright) new technology LEDs , which are used for new generation traffic lights (8000 mcd - the brightest on the market), so they are the perfect ones for advertising. You can see the light from several hundred metres in day and much longer at night. Our advertising billboard can be seen in full sun light! If you think it is too bright, you can simply adjust brightness by the software. We recommend to adjust the led billboard brightness: 100% - daylight and to 5% - night light. Please, watch videos below to see the brightness differences. Some LED sign makers say: our LED signs you can see from even thousands of meters. It is true. Our signs you can see from the same distance , but you should know about something else: from which distance your customer can read the text! It is the most important thing for advertising content. Our Led Billboards have a point lighting LED's. It means that you can see the text from far away (distance depends on LED billboard size, eg. billboard: 2 m x 50 cm - text from about 200 m). Led billboards housing is made of 2 mm sheet aluminium, painted powder technology by high quality paint, which is used to paint skyscrapers, so therefore we can forget about the next painting even up to at least fifteen (dozen) years. LEDs holes are made by a digital laser burning method, so in this connection every light point is the same distance from each other and the holes' diameter is very precise. The holes are protected by high quality foil with 5 years producer guarantee in external conditions. There are two leads on one of our billboard side, first - power supply and second - used to programme led billboards. These leads are inserted by a waterproof gland seal. Our LED billboards thickness is approximately 9 cm (3,5 inch). It is possible to programme our led billboards by wireless technology Bluetooth and Ethernet. Buying any led billboard / led sign you should know more about the working area. There is an area where the LEDs are and this area only works for your business. Make sure what you are buying. Do not waste your money on an ineffective frame and do not lose an opportunity to extend your LED sign size in the future. Our Led billboards have a smart design, so they DO NOT have any frame and the billboard area equal LEDs area - working area. Additionally you can compare our LED billboards to LEGO. It means that we do not have any problem to widen our billboards. When our client decides to widen his existing billboard we can do that for him, e.g. He already has 200cm x 50cm billboard, but he wants 400cm x 50cm or 200cm x 100cm we will join another 200cm x 50cm billboard to his. Still too small - we will join another one to make 600cm x 50cm, etc. Do not worry about mounting it on your outside walls, columns, roofs etc. Our advertising LED billboards have a double foil used by advertising companies (one layer inside the billboard and the second outside the billboard). For example, someone paints or drops something (not erasable) on your billboard, you do not have to worry. It means that you can easy change the outside foil (you can buy it in any advertising company) and the problem is gone. 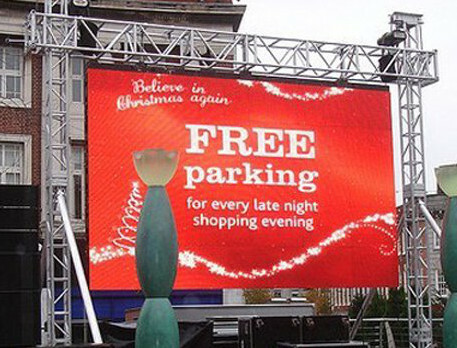 Also our LED billboards casing is made of aluminium, so if someone throws something (a bottle, stone) - nothing happens. Our LED billboards do not have plastic casing. We insert new technology electronic elements to our LED billboards, little roof and a double layer of foil to make sure that nothing happens by reaction with water or humidity. Water for our led billboards - it is not problem. Our led signs can work in the most unfavourable conditions: rain, snow, heat and humidity. There is an opportunity to communicate with your customers without knowing their language. Do you have a business related with non-English customers? This advertising is for you. Inform your customers, what kind of products you have for them (even if you haven't got a clue what the lettering on products means) or your staff speak other languages. You can write presentations in any language available on your computer and change it whenever you want. We recommend to use our OUTDOOR ADVERTISING LED SIGNS as advertising tools, but they can also be used as: LED clock signs, large LED thermometer, notice boards, commercial board, indoor LED displays, window signs, etc. Easy to operate (by your PC with friendly software), install and service. Advertising LED Billboard helps you get a lot more customers and your business will be seen from hundreds of metre. The LED lighting solutions are especially reliable and highly rewarding when it comes to lighting the floor in houses, restaurants and other residential and commercial places. See the LED lighting systems for floor sanding Bristol in order to discover the true beauty of LED lights for lighting up the interior. The University of California Berkeley is installing SSL retrofit kits from Sentry Electric, Southern California Edison can now offer LEDs on utility-owned poles, and four more North American cities launch LED projects. Sears in Canada and Macy’s in the US are both undergoing major LED retrofit programs. Meanwhile the LED lamp market in Japan is growing fast, LSG has produced 1 million lamps in the first quarter of 2011, and US legislators are seeking to reverse the incandescent bulb ban. LED BILLBOARDS: so-called led moving sings, led displays, led digital moving message, diode boards, led programmable message's centre, electronic text and graphic led panel, signage applications, led vision text, electronic message centre -EMC, London Outdoor promotional text graphic displays, electronic marquees, the UK led sign display billboard, multi-line led display, led advertising electronic led signage outdoor signs large led display electronic led signs signage board, etc.